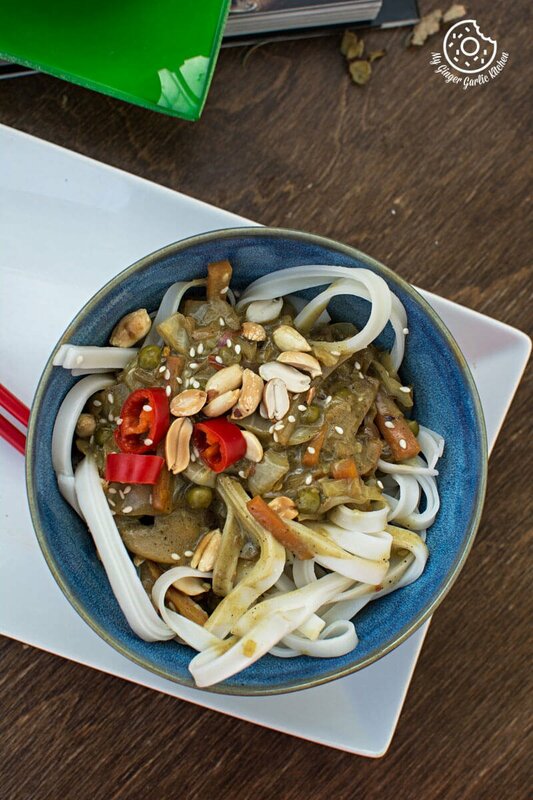 Vegan Thai Green Curry Vegetable Noodles. 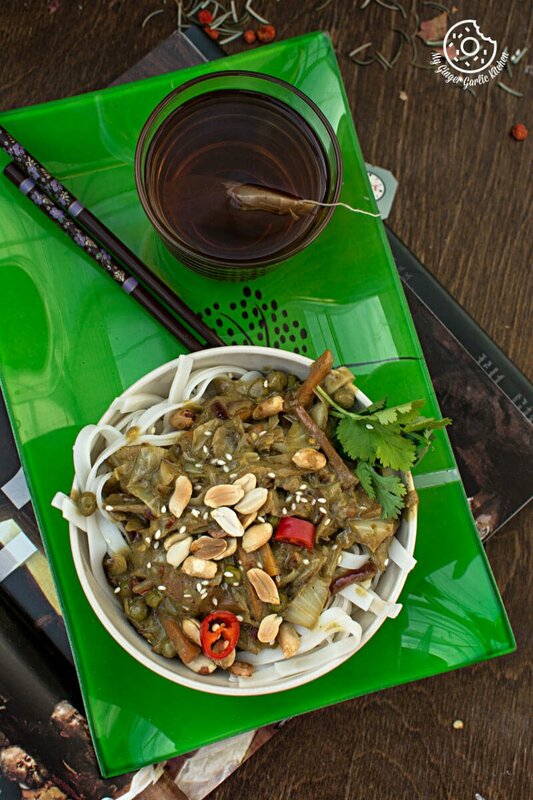 This bowl is full of rice noodles. The stir-fry has a mix of peanut oil, ginger, garlic, a little rice vinegar, tamari, chili flakes, sesame seeds, salt and pepper and green curry paste and a lot of veggies. Recently I made some gluten-free, vegan noodles. 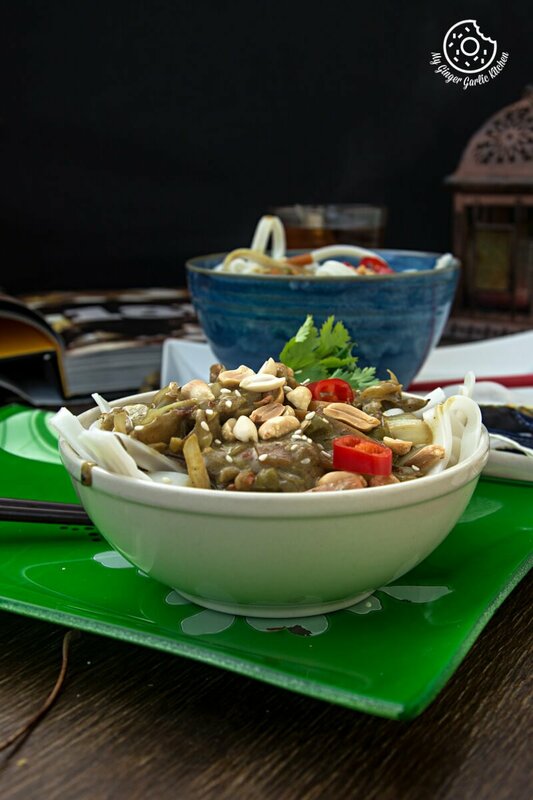 It has Thai green curry with lots of spices and flavor bursting ingredients. Monday and some comfy NOODLES sound like a win, isn’t it? And especially at a time when it’s super cold outside and has been snowing all night. Hey, have I told you that Autumn is so over here? It went so fast this year. Never seen anything like this for the last 5+ years. Everything is covered in the snow since last week. Oh gosh! Where did the Autumn go? When did the winter start? It just felt like Autumn just started and now it’s winter already. Of course, what else would you call it when it’s already minus 5 °C, and dropping down further with every passing day. Like many of you, I also love Thai food. I just love how Thai food is so delicious and so full of the flavors. Some dishes take an incredible amount of time to prepare. And sometimes we simply love them for the taste they provide at the end. So no matter how much we love long and time taking recipes, there are times when we all need super fast and simple recipes. Isn’t it? Especially on a weeknight when we come home tired and want something which can be prepared in no time. 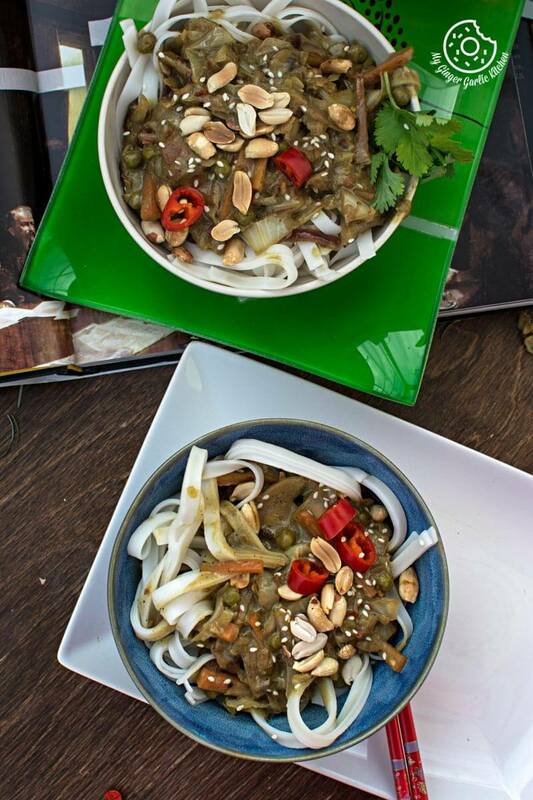 These Thai green curry noodles are everything an easy weeknight meal should be. Why? Because they are simple and satisfying. And like most of my fuss-free recipes, making these is easy too. 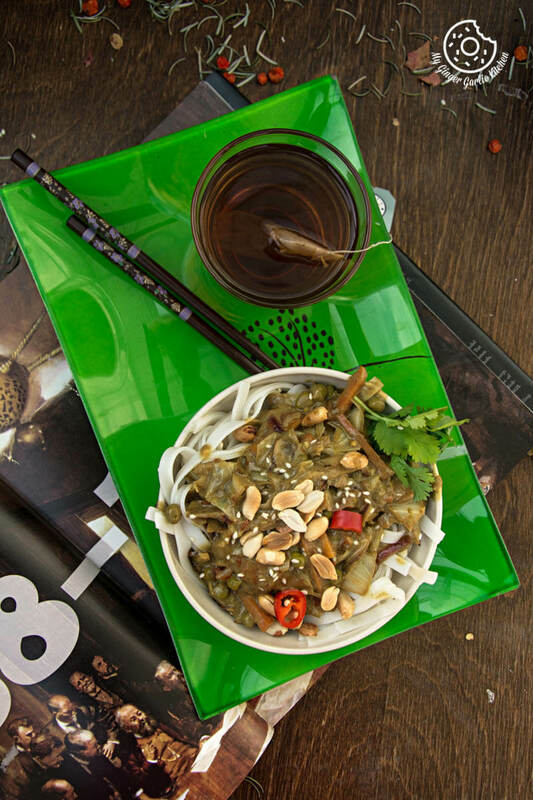 You know what is the best part about this noodle bowl? They don’t really require a HUGE list of ingredients. Most of the ingredients are just different veggies. I have added many veggies but you can surely add any veggies or meat you like. So making them is very quick and simple. Try them and you will know for yourself. 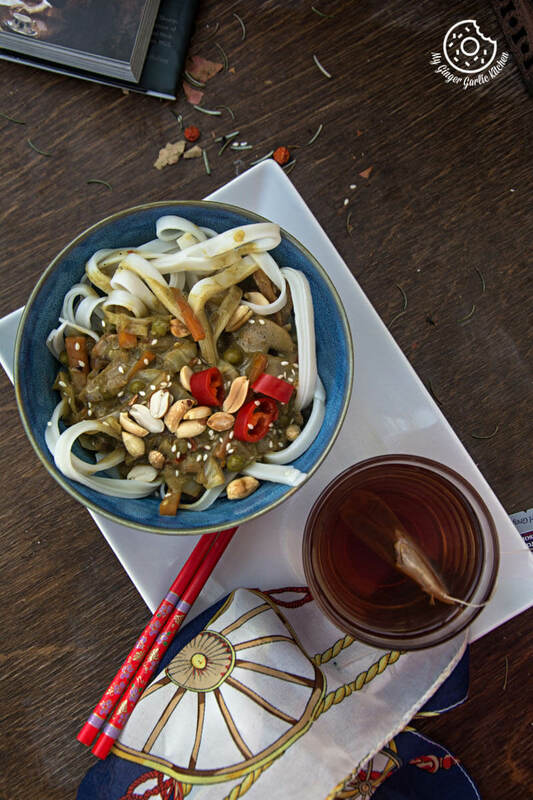 This bowl is full of rice noodles. The stir-fry has a mix of peanut oil, ginger, garlic, a little rice vinegar, tamari, chili flakes, sesame seeds, salt and pepper and green curry paste. And also they have a lot of veggies. 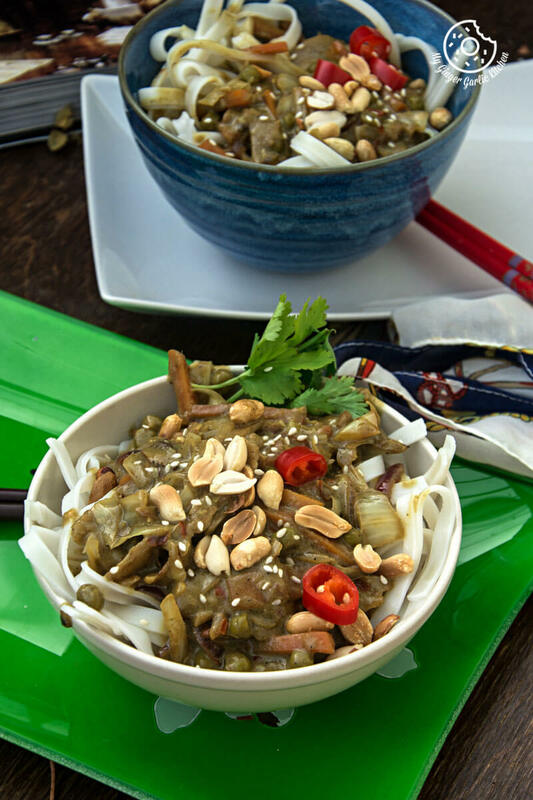 It also has the garnish of cilantro, peanuts and sesame seeds. Plus, it’s ready to eat in under 25 minutes. Best ever — so full of awesome textures, flavors and satisfying meal is ready to be devoured. Heat a medium skillet on medium heat. Add oil. Now add the onion, and sauté until nearly translucent. Add the garlic and ginger and sauté for another minute. Add the mushrooms, carrot, cabbage, and sauté for 4-5 minutes. 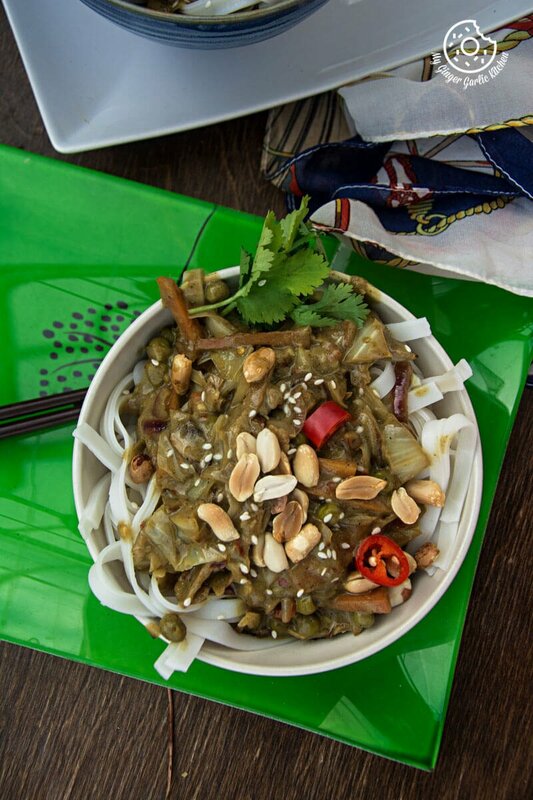 Add green curry paste, green peas and cook for 3 minutes. Add salt and pepper to taste, and sauté for 1 minute. After 1 minute, add rice vinegar and tamari and sauté for 1 more minute. Add chili flakes and sesame seeds and cook for 2 minutes. 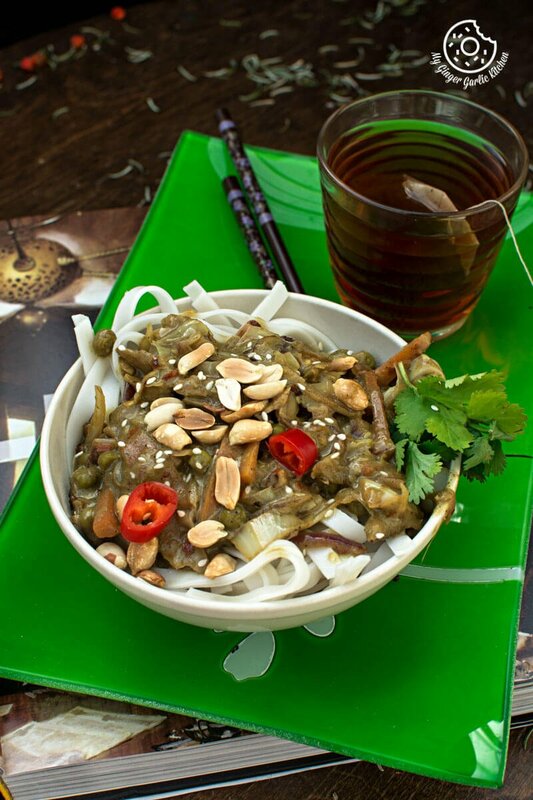 To serve, divide the noodles among 4-5 bowls and top with curry. Top with roasted peanuts, and sprinkle with sesame seeds.